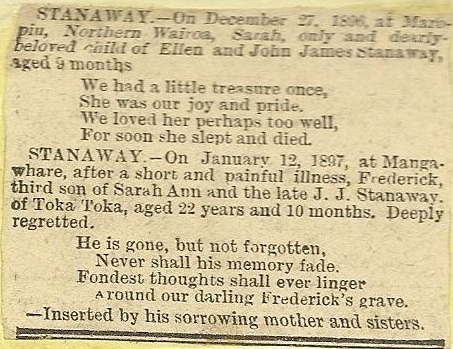 Sarah Stanaway was the first child of James John Stanaway and Ellen Williams, born in April 1896 and registered in Dargaville. (Birth Certificate Number 1896/15940). Tragically Sarah only lived for approximately 9 months, she died on 27 December 1896 at Maropiu, Northern Wairoa (Death Certificate Number 1897/63). We had a little treasure once, she was our joy and pride, we loved her perhaps too well, for soon she slept and died.